Home Job Opportunity N-Power Physical Verification Date Prosponed? Report from N-Power social media platforms indicate that the date for the physical verification exercise for pre-selected volunteers that was suppose to kick off on the 4th of December 2017, will now be delayed to a new date that will be between Monday 4th to Friday 15th December 2017. The question now on the mind of N-Power pre-selected volunteers is "how soon is soon?". 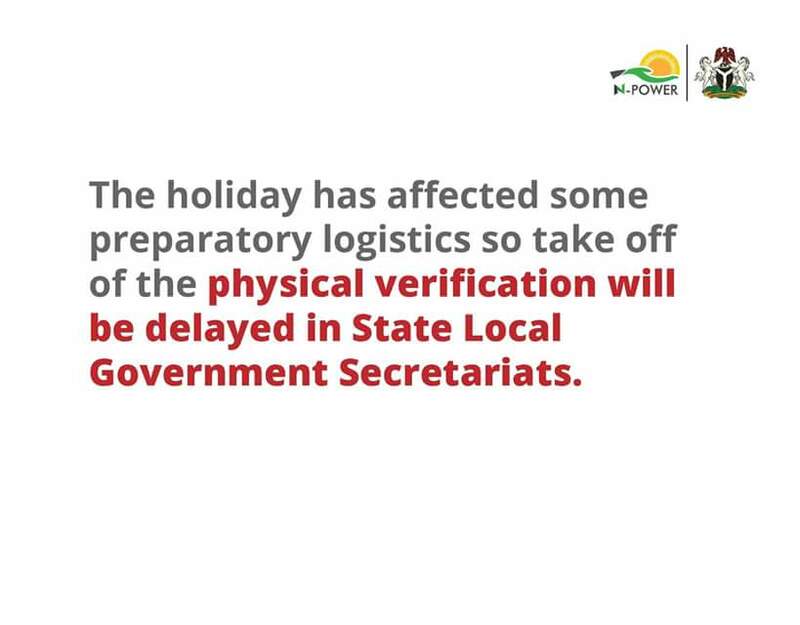 Rumours have it that the verification exercise will commence fully by next week Monday being 11th December 2017, according to N-Power the reason for the date to be delayed was due to the Salah holiday which affected some logistics and they urge preselected volunteers to "choose any date on or before December 15th to do their verification" and stress that " the date for the verification has not been postponed". You will be updated when any development arises, stay tuned.